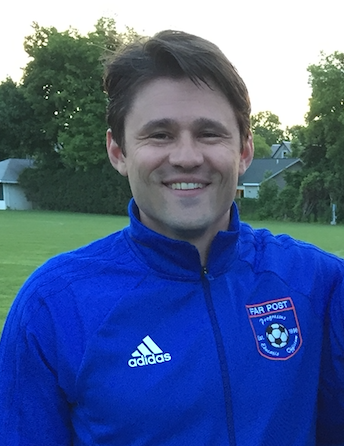 Adam Pfeifer | Far Post Soccer Club, Inc.
Far Post is delighted to announce that it has added Adam Pfeifer--Head Coach of the Norwich University Men's Soccer team--to it's impressive list of coaches for the 2017/18 Season. Adam grew up in Newton, MA, where he earned NSCAA All-American honors as a senior in high school as well as the NSCAA Massachusetts Player of the Year and the Gatorade Massachusetts Player of the Year in 1999. He then went on to play at Boston College from 2000-2003, finishing in the top 20 on the school's all-time points list and top 10 on the all-time assists list. While at BC, Pfeifer was a four-year starter, leading the Eagles to two Big East Tournament titles and three NCAA Tournament appearances. Adam served as the Associate Head Coach at Northeastern University for eight seasons before departing for Vermont, where his wife Kate was named the Head Field Hockey Coach at UVM. He then served 2 years as an Assistant Coach at Middlebury College before being named the Head Coach at Norwich University in March 2016. In his first season with the Cadets, he went 12-4-4 and finished as conference finalists, having lost in penalties in the final. Adam will take over as Head Coach of the U19 Boys Premier team starting with the 2017/18 Season. His placement is meant to give our oldest players exposure to what college soccer is like and will be incredibly valuable as they navigate the college search process, communicate with college coaches, and figure out if soccer is a piece of the equation for them. Adam will circulate and work with a number of our oldest teams occasionally as well. In addition, he will serve as the Head of College Search for all players in the club. Acknowledging that there is a need to provide more to it's oldest players, the club has created this role specifically to provide it's players that want to play in college a resource within the club that they can use and help them develop a plan to get them to where they want to be. In addition to Annual College Nights, he will meet with each of our HS-aged teams at the beginning of the season and be available for individual meetings with players/parents. Adam lives in North Ferrisburgh with his wife, Kate, and daughter, Veda.